Foster's Story . . . Original: "This little guy is all puppy with boundless energy; he appears to have two speeds: Mach I and sleep." When Foster’s owner in West Virginia had too many dogs and too little space, he relinquished this bundle of fun to a shelter. Foster obviously had been well loved and had lived in a home, so the shelter reached out to MAESSR to help the youngster find a furever home. Foster is housetrained and runs to the door to indicate his need to go out. He follows with a whimper if need be. He does sleep overnight in a crate (although he would much prefer the bed) and is crated during the day while his foster family is out as he does sometimes annoy the older resident dog with his playfulness. Kids will be kids, you know! Foster sometimes hesitates before entering his crate, but once in, settles down right away. This little guy is all puppy with boundless energy; he appears to have two speeds: Mach I and sleep. And, in typical Springer fashion, he is conquering his house, quite literally in leaps and bounds! Foster is an extremely playful dog with both humans and other dogs. He enjoys toys and will entertain himself for quite a time with a ball or a squeaker. Every day is a new adventure for this pup. He loves to run and has enjoyed "Springer Time" with up to 5 other dogs. He seems content to let one of the resident dogs be the pack leader, and while his puppy behavior has drawn a few reprimands from the older Springers, he holds no grudges. Our guy knows some basic commands including his name, “come,” “sit,” “down,” “shake,” and “no”; but, again, he’s a puppy and needs frequent reminders. He does well in his foster family’s fenced-in yard only needing an occasional reminder not to dig! Walking on a leash is still a work in progress for Foster, but he is learning with help from a “Gentle Leader.” He rides well in a car although he is restrained so he does not attempt to take over driving. This bundle of energy becomes a Velcro dog when it’s time for belly rubs and brushing; he doesn’t mind at all having his feet and ears handled. Foster is very food-driven. He inhales his food and lets out a large belch to show how much he enjoyed his meal. His foster family is scattering his food in an attempt to slow him down. He is fed on a leash to keep him from going after the resident dogs’ food bowls while they are still eating. Right now, Foster is a high energy boy. He is Springer, Springer, Springer and puppy, puppy, puppy! He is quite curious and appears very smart. Basic obedience training is in his future as MAESSR only places puppies in homes that are committed to training and bonding with the pup in obedience classes. Puppies require a lot of care, attention, and patience, and they do chew on things! The decision to get a puppy and raise it to be a healthy, happy, and well-adjusted dog is a serious commitment. 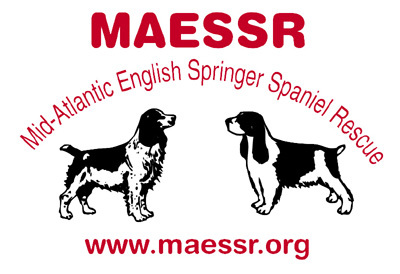 To reinforce this commitment, MAESSR requires all adopters of dogs under 1 year old to enroll their puppy in an obedience class within 60 days of adoption. Foster’s love of food, curiosity and intelligence will help him be the star of his puppy class. Foster is super dog in every way and will soon be ready to make a wonderful family pet in a home willing to give him love and the attention that he craves and the training necessary for a young Springer. Foster would enjoy having another dog friend or older children in his life—ones who won’t be susceptible to inadvertently being knocked down by his enthusiasm. This little pup has soooo much love to give!